Against the profoundly depressing background of the Brexit fiasco, a brighter glimpse of the future has been revealed by two events, a theatre production, a radio broadcast and a meeting in the past couple of weeks. The conversation about climate change and its connection with culture is growing wider and more mainstream. The first event was our own Green Arts Conference (you can read the report here), which was a very encouraging affair. Over 100 participants – and I use the word advisedly – came to Partick Burgh Hall in Glasgow on 1 November for the third of our conferences: a change in venue to accommodate the numbers. Most were Green Champions from our Green Arts Initiative members (if your organisation hasn’t yet joined, you can do so here), but there were also people from tourism, the Scottish Government and others. Over three years we’ve seen increasing engagement from arts and sustainability organisations across the country making connections between the sectors. The focus of the Green Arts Conference has always been on sharing knowledge between people at the carbon-face rather than sitting in rows hearing from ‘experts’. We did however have two important talks. The opener was Kenneth Fowler, Director of Communications at Creative Scotland (Scotland’s arts development agency) who gave a beautifully illustrated and very positive talk on why and how Creative Scotland is not only reducing its own environmental impacts but also interpreting the third Duty on Public Bodies under the Climate Change Act by introducing a requirement for its major fundees to develop carbon management plans. Over the course of the day more technical sessions on Carbon Management Planning, and our support of the sector in developing those plans, were well attended and supportive. Then after lunch Anna Beswick of Adaptation Scotland gave a great introduction to climate change adaptation – broadly why, what and how. Her argument and examples were clear and compelling. This was I think a new area for much of the audience and even in the graveyard, post-prandial slot Anna’s talk was attentively and enthusiastically received. We will be meeting with Anna and her colleagues soon to develop plans for our support of cultural organisations in developing adaptation strategies. Once again, this is the nimble, innovative and imaginative cultural sector piloting work that can be adopted by other sectors, as most adaptation work to date has focused on larger bodies such as health trusts and local government. Not much has been done with SMEs, and yet they will be equally affected by the physical and regulatory impacts of climate change and will need to adapt to and help shape the new world. The ‘Show and Tell’ sessions where participants share their experience were even more successful than in the past. Overall there was an encouraging buzz in the room and it felt more than ever as though the participants owned the conference. That weekend I travelled to Nethy Bridge in the Cairngorms for a Green Tease, organised in partnership with the RSPB Scotland. Abernethy is the second largest RSPB reserve in the UK and has the largest area of original Caledonian Pine Forest in the country. Forest Lodge is 14 miles from Aviemore, much of it down a rutted, unfinished road. Yet 30 people found their way there from Inverness, Aviemore, Edinburgh, Aberdeen and elsewhere, most of whom we at Creative Carbon Scotland had never met before. A good mix of scientists, naturalists and artists of various stripes. We had a terrific presentation from the reserve’s Senior Site Manager Ian Perks and then a (freezing!) trip to locations in the reserve. We stopped by the oldest known ‘granny pine’ in the reserve, about 400 years old, with its offspring surrounding it, which even when it dies will continue to have an impact as it decays over another 400 years. We learned about the overgrazing by deer, which selectively feed on the seedlings of broad-leaf species, meaning that the birch, willow and rowan struggle to survive. Reducing the deer numbers and allowing the pine to reseed themselves whilst providing ‘seed source’ saplings of the broad-leaf species we saw how the landscape can be encouraged to regenerate itself. 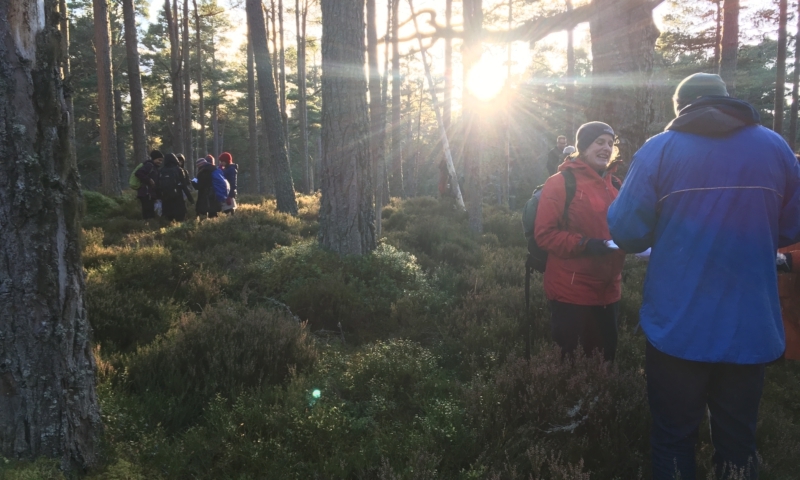 While there we were taken through an exercise by artists Reiko Goto and Tim Collins which asked us to consider the forest in different ways, related to the philosopher David Hume’s ideas about Relations (Hume was always Capitalising Things) . The joint exercise was illuminating, helping us understand the forest afresh through ideas of time, space and change. I was thrilled to see the wide interest in this combination of art and climate change from a range of people. And it took me back to my undergraduate philosophy days. The observations which emerged during the workshop are summarised here by Tim and Reiko. The theatre show was the beautiful Wind Resistance, singer-songwriter Karine Polwart’s storytelling/dance/musical performance which I caught on the last night at the Lyceum in Edinburgh. It was originally produced with the Edinburgh International Festival in 2016 when it sold out in a smaller venue and last week too it was packed out and received a standing ovation. Polwart’s very personal look at Fala Moor in Midlothian, and the thousands of pink-footed geese which land there annually on their long migrations north and south across national boundaries, touched upon carbon sequestration in the peat bog, the strange beauty of wind turbines, biodiversity and the risk of habitat loss. Probably the best show I’ve seen in a couple of years it combined culture and climate change (and Alex Ferguson’s theories of football management) effortlessly, asking for joint working to ensure the protection of such places: a good riposte to all those who want to create borders. But what struck me most of all was that this show was a conversation between audience and stage about the intersection of climate change and culture, and there was a large and enthusiastic audience wanting to take part. Good theatre allows the audience to experience, vicariously and yet somehow genuinely, what’s going on onstage and in the characters’ and performers’ heads. This was strengthened by the fact that many of us probably knew Fala Moor, or at least had some sense of places like it. (A great reminder of what local theatre can uniquely achieve in an era of live streaming and international touring.) It deserves a third outing. Then Will Self’s A Point of View on Radio 4 last Sunday charted his move towards vegetarianism for moral and environmental reasons. He’s a great writer and made a compelling argument. It’s worth a listen. And the meeting? Perhaps most striking of all, when I went to meet Leonie Bell, who’s leading on developing the Government’s Cultural Strategy, who was there too but Katherine White! Katherine is the Head of Strategy for the Scottish Government’s Energy and Climate Change team, and was joined by her colleague Helen Mansbridge. We had a lively and very engaged discussion touching upon both areas of work. When those two departments are working together, I have real hope. A couple of years ago this and the wider conversation wasn’t taking place. Now I keep finding it everywhere, and despite my gloom and shouting at the news, that offers a glimmer of light. It would be nice to say that it’s all Creative Carbon Scotland’s work over the last six years that has brought to centre stage this burgeoning national conversation about art and climate change. But perhaps even better than that, I think we’re riding – and at the front of – a wave of interest. The conversation is happening all over Scotland and Creative Carbon Scotland’s role is to bring people together, stimulate the debate and help make sure it’s rigorous and informed. Most months I send an email of bits and pieces to people who seem interested in my blog and/or are working on strategy in the cultural and sustainability fields. It’s a select group, but if you’d like to join it, let me know.